Getting hearing aids for the first time can be extremely exciting. You know there are sounds you haven’t heard in years, and you’re looking forward to enjoying a social life, and following conversations with ease. However, getting used to new hearing aids doesn’t happen overnight, and you’ll need to be patient with yourself during the first week or two with your new devices. When you’ve been living with untreated hearing loss for several years, your brain has been missing a lot of sounds in your environment. You’re not used to hearing certain sounds, and your auditory centers haven’t been processing so much information. When you put in your new devices for the first time, you might be overwhelmed by all the sounds around you, and your brain will be in high gear trying to make sense of all this new information. If you’ve been living with untreated hearing loss for many years, all this new noise can be uncomfortable. Your brain has adapted to hearing only a few sounds in your environment, so you will need a few days to get used to all the sounds your ears are now able to hear. When it comes to getting used to new hearing aids, one of the most important things is the fit of your devices. If the hearing aids are uncomfortable to wear, the fit needs to be adjusted immediately. You will notice that something is in your ear, but there should be no pain or discomfort at any time. Getting the right fit will also ensure that the hearing aids are able to process all the sounds around you, and reduce feedback or any other whistling or ringing from sounds reaching your ears around rather than through the hearing aids. When you first get devices, you’ll be excited by all the sounds you can hear, but take the time to start slow. Wear your devices in the quiet of your living room, and have a conversation with your loved ones. Take the dog to the park, and invite the family over for dinner. Adjust to your devices, and slowly work your way up to meeting friends for drinks in a crowded bar. You’d never jump into the deep end of a pool until you’ve learned to swim, and it’s the same with your new devices. Your brain needs time to get used to your devices, and adjust to how they help you hear in background noise without it becoming overwhelming. Your brain and your ears will need time to get used to your new hearing aids, so wear them all day, especially during the first week. If you get tired, take a short break, but be sure to put your devices back in again as soon as possible. By the end of the week, you should be used to your devices, and feel more confident with all the new sounds in your environment. Your hearing health specialist will work with you to make sure you learn all about your new devices, and how to adjust the programs and settings based on the listening environment. Be patient with yourself. It will take you and few days, and maybe a few more visits to our office, for you to learn what your devices can do. Become confident switching between programs, adjusting the volume, and selecting the right settings for what you’re hearing. If you’ve just purchased your first pair of hearing aids, it’s important to go for follow-up visits. 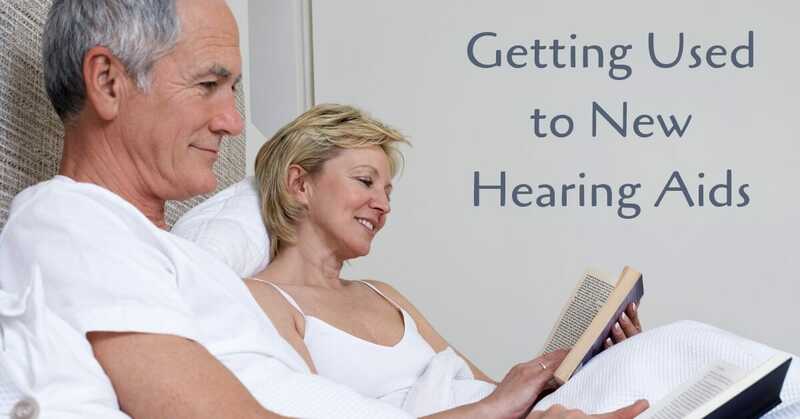 At My Hearing Centers, our team will take care of all your hearing needs, from the comprehensive hearing test to recommending the perfect devices that will fit your lifestyle, hearing needs, and budget. After you’ve fallen in love with your new hearing aids, be sure to visit us for follow-up visits. We’ll make a few adjustments to how the devices are programed, so that you’ll be hearing clearly in every situation, and your devices will do all the work for you. If you’ve had any trouble getting used to your new hearing aids, call us today at My Hearing Centers.